← He Drinks! From A Cup! This winter squash risotto is amazingly good. You might call it a “gateway risotto” because once you eat it, all of a sudden you’ll start making all kinds of risotto. Although it requires a lot of stirring, it’s surprising easy to make and SO delicious. It’s comfort food to me now. My sister-in-law, has been asking me for this recipe for a long time. Sorry it’s taken me so long, Meggan! If you want to try other risottos, we’ve also loved yukina savoy risotto (good for any hearty green and with any kind of seafood), parsnip risotto with spinach (my favorite, maybe even more than this recipe), broccoli and cheddar risotto (in the oven – so EASY! ), and endive risotto. 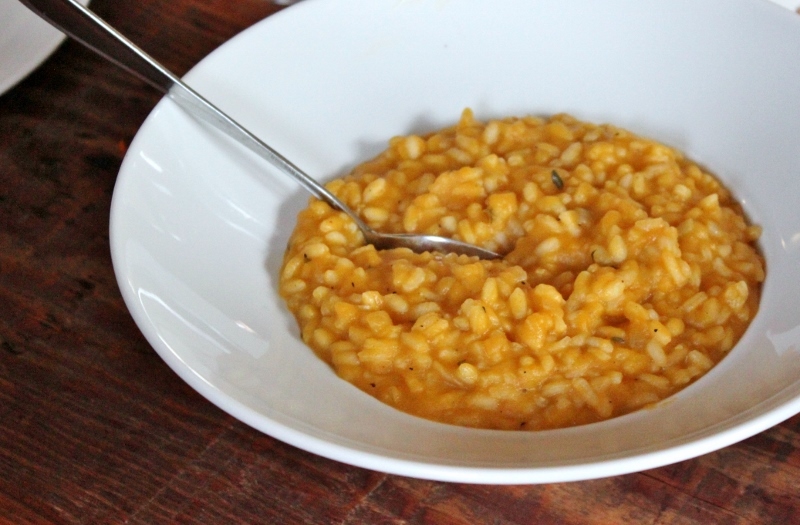 risotto, swimming in pumpkin – amazing! Heat the oil in a large sauce pan over medium heat. Add the onion and cook, stirring occasionally until the onion is tender but not brown, 5-7 minutes or so. Once the onion is tender, add the onion and stir until it’s nicely fragrant, about a minute more. Stir in the rice, stirring constantly, until it starts to smell toasty, about 2 minutes. Add to the pan and stir it in until it has mostly absorbed/evaporated. This will happen very quickly. Stir in and stir occasionally until it’s bubbling. This will probably happen quickly. This step is entirely optional. Up until this point, the recipe can be vegan (if you use vegetable broth) and is also dairy-free. If you want to add the cheese and butter, it will make it extra decadent. One time, Nik forgot to add it and we discovered that we like it better without the cheese and butter. Because we add the extra pumpkin (see below), it doesn’t need the additional fat. Your choice on this one! Season with black pepper and salt as needed. Serve immediately and consider yourself addicted! *We buy our Arborio rice at Trader Joe’s but I think it’s fairly easy to find in grocery stores these days. Just make sure you’re buying the plain rice and not the kind with seasonings added. And yes, risotto is essentially white rice, which we typically avoid and haven’t eaten in years (except when we’re making sushi). So my next step in our risotto eating journey is to figure out whole grain alternatives to white Arborio rice. This has some intriguing ideas. ***The original recipe only calls for 1 C of cooked squash. We put in 2 ½ C because that’s how I freeze our squash in the fall. We love the flavor of a risotto with lots of squash in it. Feel free to reduce this amount. You’ll just might need to add more broth. If you’re using canned pumpkin, I would use the whole can. This entry was posted in cooking and tagged risotto, winter squash. Bookmark the permalink. looks delicious! I love risotto. I’ll probably end up making some tomorrow now that i’ve seen your post! I made this yesterday with butternut squash. It was good! Although, a note for anyone who stumbles across it: If you only have powdered thyme, lessen the measure. I didn’t and it was a little overwhelming. I think if you factor for the air between dried thyme leaves I probably should’ve used 1/4 tsp. Now that I’ve made a risotto I’m excited to try out some more! I think we’ll do a mushroom one next as I know it’ll make the husband super happy. Thanks for this Dani. I can see how ground thyme would be overwhelming. Hope you enjoyed the mushroom one too. Making risotto can get to be a bit addictive!